There is An "Overview and Getting Started" section containing videos that serve as an introduction. 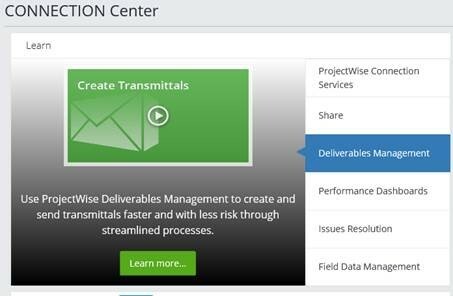 You can not only view the Overview video here, you can also access it from https://connect.bentley.com/ by clicking on "Deliverables Management" and then playing the video. In the Learning Path the training sections are set up the same way as the hands-on workbooks; How Do I Set It Up? and How Do I Use It? Each video covers a specific feature. There is one more component, and that is the pop-up information. Click on a video's title and you'll see step-by-step instructions about how to use that feature.